For most cooks, the idea of having fresh herbs at your fingertips year round — without shelling out $3 for a fistful of wilted mint — is wishful thinking. While homegrown herbs save money and perk up countless dishes, stories of failed attempts abound and the process can be daunting. But it doesn’t need to be. Understanding what herbs need in a home’s environment will go a long way to planting a successful garden at any time of year. From lighting to harvesting, here’s a guide for growing herbs indoors. Before you even choose which herbs to grow, assess the lighting in your home to find the brightest location. Look for south-facing windows, which get the most direct light exposure. Northeast- or northwest-facing windows get medium to low light, but the most forgiving herbs can still thrive in them (see below). Once you’ve evaluated your home’s natural light, keep it in mind while choosing which herbs to grow. I always recommend growing what you like to cook and eat. Plants generally require a minimum of 6 hours of direct sunlight per day; this is vital for growing healthy, lush herbs. If they’re not getting enough light, your herbs will tell you. Their stems may become thin and spindly — a sign they’re stretching themselves to take in more light. If you grow basil in a low light, its leaves can become pale green. These symptoms indicate that you need to move your plants to a brighter location. If you don't have enough light — whether your home’s natural lighting isn’t adequate or the daylight is too brief — you can place your herbs under a grow light. A simple 100-watt full-spectrum light bulb (about $16 on Amazon) left on for up to 8 hours will emulate full daylight. Position the light about 8 to 10 inches above the plants. Finally, be sure to keep herbs away from heating vents and extreme cold. The ideal temperatures for indoor herbs is between 55 to 70 degrees Fahrenheit. Once you decide what you want to grow, you may wonder if you should start from seeds or starter plants (or already-established plants). The former can be tricky for the novice gardener, but some herbs are easier to grow from seed than others. Sage, basil, thyme, and oregano are among the easiest; they generally take between 10 to 20 days to germinate. But for the beginner gardener, I always recommend starter plants: Not only are they simpler to maintain, but they’re widely available and you can harvest a few sprigs right away. Look for plants that have a healthy green shade. Avoid plants that have yellow leaves or that seem to be soft or wilting. While you’re buying them at the garden center, pick up some soil and appropriately sized pots, too. 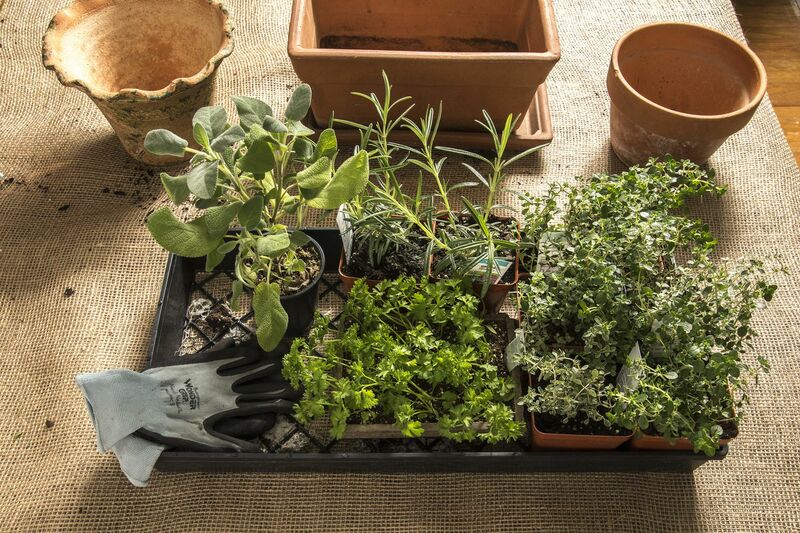 Herbs grow best in a well-drained potting mix and that starts with the soil. I use an equal-parts mix of premium organic potting soil and sand (which helps break up the soil and improves drainage). If you’re willing to pay more, choose an organic potting mix; it contains beneficial macro- and micronutrients that build strong roots. A monthly dose of fish emulsion fertilizer — organically made from fishing by-products and seaweed — will also help grow healthy plants. It delivers added nutrients, including nitrogen, phosphorus, and potassium, and restores the beneficial microbes to depleted soil. When it comes to potting starter plants, I recommend using terra-cotta pots rather than plastic; terra-cotta is porous and allows soil to dry out more thoroughly than plastic. Potted plants need drainage, so one should never use any containers without holes (including mason jars or decorative pots). I also prefer growing my herbs in individual pots, since they can be opportunistic and take over other plants. While this is a struggle for those short on space, past experience has taught me herbs like basil and parsley need room to grow without competing for water and nutrients. Use your starter plants to determine which pot you should buy. You generally want to choose a pot with a diameter 2 inches bigger than the starter plant’s container. For example, a 4-inch starter plant can be potted into a 6-inch pot. To transfer the starter plant, first fill its new pot with a layer of potting mix (or a blend of sand and soil). Then loosen the starter plant’s root ball, releasing it from the container. Place it in the new pot and use the soil to fill in the gaps around the root ball. Leave ¼ inch of space from the top of the soil to the top of the pot to allow for any overflow when you’re watering. As your plants grow, it’s important to ensure they have ample room. Herbs can become root-bound (also called pot-bound) in a season of growth; the roots will begin to push out of the bottom of the pot and won’t retain water as well. This is a telltale sign that it’s time to repot. Transplant root-bound herbs into a slightly larger pot. To gauge when to water your herbs, feel the soil and lift the pot. The soil should be dry; the pot should feel light in weight. Use a watering can or take the herbs to a sink. Water the soil until the liquid pools, then allow it to flow through the plant. Some houses are drier and warmer than others; check your plant every few days or so to see if it’s dry. Herbs love humidity. Boost the moisture in their environment by misting them two to three times a week or placing their pots on saucers filled with moist gravel. Harvesting your herbs regularly will prevent them from going to seed (also known as bolting in the plant world). It also encourages more growth — and after all, you grow herbs to use them. I recommend keeping them near the kitchen so they’re easy to maintain and harvest. Snip herbs like basil, sage, oregano, and mint where the leaf and the stem meet. Trim herbs such as rosemary and thyme as soon as you see new growth. Cut parsley, cilantro, and chives 3 inches above the base of the plant. You can harvest herbs as needed, but keep in mind that overzealous snipping can stunt the plant. One plant can only give so much and harvesting daily won’t allow the herbs to regenerate. Clipping five or six sprigs at one time may only give you a tablespoon of leaves to use. If you intend to a use lots of herbs, I suggest increasing the amount you are growing. If you use parsley all the time, plant a large container. You can pot multiple plants in one pot — for example, three 4-inch parsley plants can be planted into an 8- to 10-inch pot. Finally, when the weather warms up, consider moving your indoor herbs outside — they’ll thank you for it. Tina Sottolano-Cain is a gardening consultant. Her website is gardensonthego.com.